Don't get me wrong I am not arrogant about it, nor do I get up every morning and think "Yes! I belong to a country with some of the greatest minds, cultures, traditions and the most passionate people in the World!" Not every morning ;-)! However, there are often times when I just sit back and think this is my tradition and culture and I am proud of it. Like last night for example. I will get to last night a little later but first I want to tell you that it took me a while to get to this point. For the "real" Indians back home or living around us, I was your clichéd Indian girl who left India at a very young age and brought up all over the World. Went to American and British schools and had friends from all over the World. Dresses, talks and acts "like one of those westerners" was often said about me. My parents taught me the traditions and cultures of my country but never forced me to practice anything religiously. They also understood that it is not always easy to bring up children with feet in two worlds. As long as we were obedient, respectful, bringing good grades, know the borders set and not cross them, my parents were happy with the way we grew up. However, I did at times feel like I had my feet in both worlds and was so often divided between both. For some of the so called "Westerners" I was probably the clichéd Indian girl. Trying to dress, talk and act "like one of them!" There was always a small inner conflict. Where do I come from? One of the most difficult questions for me to answer. At times I would distance myself from being Indian and other times I just did not want to be like the other expats. But as I grew older and with the teachings of my parents and grandfather I slowly learned how to handle the conflict. I know today where I come from. A beautiful country. Admired by many for it's rich and colorful culture and tradition. Envied by some for our strength, passion and minds. Loved by almost all for our spirit and values. I still dress and talk like a westerner, but I know my inner self is Indian and I am proud of it. That pride came to show 100 per cent last night. Tom and I went to see the spectacular Merchants of Bollywood. As I live in a region of Germany where not many Indians live, I was amazed to see that the entire concert hall was filled with mostly Germans. With each dance and song the place rocked even more. For me, as the actors danced a lovely traditional dance my eyes welled up with tears of joy and pride. During the break I could not help but smile at a blond dressed in a gorgeous "ghagra choli" (a traditional Indian dress) and looked on in amazement as they went wild buying the music CDs for the show. At the end of the show I was stunned at the standing ovations and the shouts for an encore. As I walked out of the doors I just could not help but hold my head up high. I guess I should now share a traditional Indian recipe with you. But I won't. Instead I am sharing a dish that is probably a little like me. 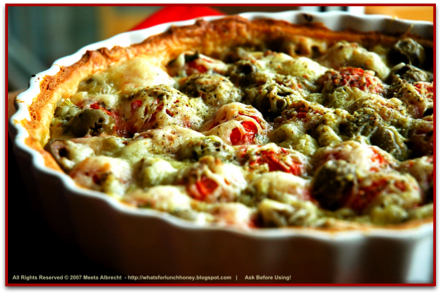 A tart, which would represent my western exterior, with gorgeous red tomatoes and green olive, the colors of which represent my Indian interior. Update: Due to the fact that I have received a few dishes from Morocco and do not want to disappoint these entries I will accept Moroccan recipes too. The first event on the Daily Tiffin is also underway. Hope you will join the DT team and Show us your lunch box. Preheat the oven at 250 degree Celsius. Line a round greased tart form with the puff pastry. Spread the base with the tomatoes, olives. onions and pesto. Cover with the grated cheese and sprinkle salt, pepper and herbs. Bake the tart for 25 minutes. Take out and allow to cool. The easiest way to preserve tomatoes is but freezing them whole. Lay them on a baking tray and shock freeze them overnight. Then place in freezer bags and return to the freezer. Whenever your recipe requires some tomatoes, simply take out the required amount, thaw, peel and use in your dish. You will find an interesting know-how for freezing raw tomatoes here. Another way to store tomatoes is to peel and puree them. Strain the tomato sauce in a fine sieve and then fill an ice cube tray with the sauce. Freeze overnight then replace the tomato pulp cubes in freezer bags. Need a quick sauce? Now it's easy! A lovely light meal enjoyed with a nice fresh salad. 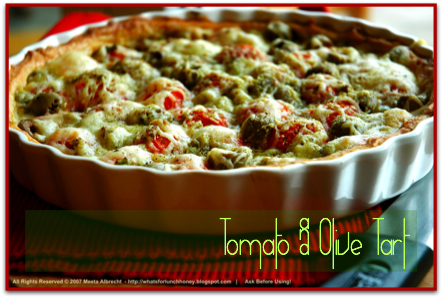 The crispy pastry base add a nice crunch to the smooth flavors of tomato and olive. Perfect for the lovely warm days coming soon. My offerings to the current Jihva theme Tomatoes hosted over at My Workshop. What a wonderful night! Your parents seem very wise...so do you. The tart looks very inviting...I am so looking forward to my herbs growing now in the garden! oh thank god..i got a Indian-german ha ha,.thats nice..so MEETA howz ur experience there in germany..(i always Cross my Fingers)..it must be excellent..i know a little bit about Germany..r u on orkut..think so..! !so can we become friends Meetaji..ha ha ..gd dy,i mean ..gd nt..
looks like u had an amazing night, great!! and btw u'r tomato and olive looks absolutely divine. I didn't venture into making tarts yet but after looking at u'r picture and recipe, i have to now!! Really a lovely post. As my knowledge of India and Indian food has increased, I've become even more fascinated with the traditions of that country. Your parents sound like they had a very good approach in letting you be yourself, no matter where you were living. But I do agree, there is something deep inside all of us that comes from the place we came from. Awesome photographs of the tart too! This looks like another wonderful recipe for my tart pans! Hi Meeta, parts of this post could have been written by any one of us - growing up in India in the 70s / 80s or in an Indian family anywhere else. However proud I am of being an Indian, I have to accept the fact that I am indeed one of the previliged 25 or is ist 30%. I also know that had i not come from this section of society, had I not had parents who were educated, travelled / exposed and liberal enough to let me live my life and find my way - I as an woman, as an "individual" might have not many reasons to be proud of this country. Sorry to bring up something negative here but I am more and more aware of all the women who have no reason to be proud of as Indians. We are more tha great minds and a great culture. Tanna Thank you. My parents are wise and I appreciate everything they did for me. Today I understand how much effort goes into giving the right values to your children. Paddukoti You certainly have to give it a great. It's easy as pie ... er tart! Cynthia Hey I can relate to what you are saying. At times like this it is very strong to have the self confidence to well defy these people. and even more important to have strong support from your family. My parents always said this to me "No matter where you are and what you do - just remember that you will never fall hard. We will always be there as a net to catch you when you fall!" Just this makes me so much confident. Hang in there Cynthia! We love you. Kalyn You are so right. I took it often for granted but now living alone and away from those roots I realize what strength they have on a person. Bri Get them out baby and give it a try. Shyam My motto is live and let live. Those who are not proud to be Indians or their own nationality probably has something to deeper. They too will soon realize how important it is to have a place to call home and a place where you know your roots are. Some come to this enlightenment sooner than others. A wonderful post Meeta! It's great that you're so proud of your roots despite living so far away from them. Meeta, during the short span of my stay here in US, I have always wondered how those kids with feet in two worlds feel and u have summed it up quite a bit. I was really happy to read that note from you. My knowledge of India and its foods improve everyday but I get lost in the multituted of regions and cuisines...lost in happiness because there are gazillions of recipes I want to try. Great post. That tart is something I could easily fix on a sunday night. Makes my mouth water! wonderful recipe for spring. it looks so gorgeous. meeta, browsed my way into your world through your comment on sig's blog and enjoyed this post sharing a bit about yourself; and, am blown away by your food photos on flickr... plus, thanks for the reminder about monthly mingle - i didn't know about it and am glad i stopped by. I am a very big fan of savory tarts. That's a great recipe. i wanted to make a tomato tart but didn't trust any recipe. now u made it and with olives too.. have to make it. What a lovely story this is Meeta. It must have been challenging for you, but it appears that you assimilated well and maintained a strong sense of Indian culture and identity. Thank you for sharing this. It also reminds me...have you seen the new movie The Namesake? It's about an Indian couple who move to the US and how their children struggle to adjust to the US while preserving their Indian culture. I though it was intelligently written, acted, and filmed. Bless your dear Indian heart....! lovely recipe and an even lovelier picture, Meeta. This looks amazing! Will have to try it one of these days. this looks amazing. nothing wrong with being proud of your heritage. your photos always calm me down. lovely. Meeta loved your write up. Once one leaves the roots it does cause confusion even if one moves around in India itself so it is more when its global it is that many times more. Phir bhi Dil hai that goes to the origins. Thanks for your wonderful support! It's interesting to see that a few share my sentiments in this too. Susan I have not seen the film yet, but my mother mentioned it the other day. So, I think I will have to get my hands on it. that tart looks gorgeous, as usual:) and I love the Arabian theme! !